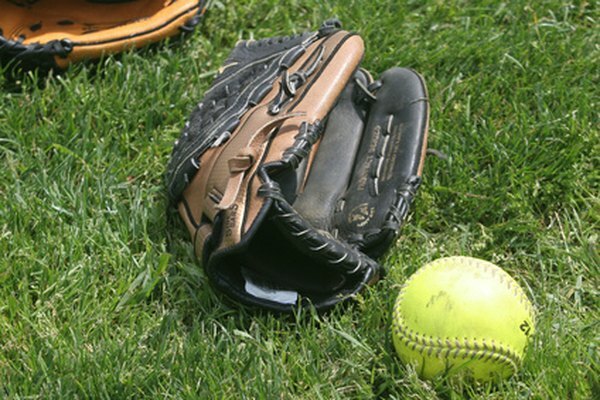 Softball is played on many levels throughout the United States, including recreational leagues, high school, college and even professional leagues. Even a group of friends wanting to play a game of softball can do so with an open space and the right basic pieces of equipment, which can be found at many sports equipment stores. A game of softball is nothing without, well, the ball. A softball is slightly larger than a regular baseball, and varies in size depending on the type of league. For instance, in recreational coed leagues, different sized balls are used for men and women. Since a smaller ball travels farther, many leagues use two balls in one game, the smaller for the women, who tend to hit shorter, and the larger ball for the men. A regulation sized softball for the American Softball Association is yellow and measures 12 inches in diameter. Aluminum and other metal materials are used to make the bats used in the game of softball since the ball comes off faster than on a wood bat. This allows hitters at lower skill levels to still be able to compete in the game of softball. Bats used in the ASA must have passed certain performance standards. One of those standards is that bats manufactured after 2004 must not allow the ball to come off the bat at more than 98 miles per hour when hit. For organized softball, raised bases are used, which runners must touch in order to advance around the base paths. Home plate, which is a flat piece of plastic in a pentagon shape, is flush with the ground, and which must be stepped on or touched by players in order to score a run. The field of play is marked by white lines and extends out to a fence or other similar structure marking the end of the field. Balls hit over this fence are considered a home run. Some players choose to use equipment that is not required in order to play the game of softball, but may help them perform better. While the rules do not require fielders to wear gloves, almost all do in order to help field the ball. Many batters also use batting gloves, which are more like regular gloves and help reduce the amount of impact on the hands as the ball strikes the bat, and also help improve grip on the bat. Players in competitive leagues also frequently wear cleated shoes, which help not only gain traction in the outfield, but help the runner avoid slipping while running between bases. Helmets are also worn by batters and runners as well as catchers to help avoid injury.